We offer the Europe's largest range of fully customisable pool tables and pool dining tables. We will work with you, or your interior designer, and our manufacturers to realise your vision. Working with a wide range of wood, metal and paints we can achieve the look you desire. Custom pool tables are one of our specialities at Home Leisure Direct, and we offer a fantastic variety of custom pool tables for home and commercial use. 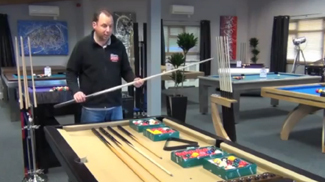 Choosing a pool table that fits with your taste is important to all our customers. Our range of custom pool tables is selected to offer you a great variety and choice of finishes, cloth colours, pocket options, sizes and lighting. Finding a pool table that suits your décor can be a daunting task, but at Home Leisure Direct we can advise you on all aspects of a custom pool table. These tables are highly customisable and can be made to your specifications in a variety of ways. Changing the finish of the cabinet and even the colour of the cloth can make a table look very different and change how it fits into its surroundings. Our selection of custom pool tables has been specially chosen to represent some of the most diverse pool tables available. All of these tables are designed to allow you to find the style and colours that appeal to you and fit best with your space, or even to inspire you to create your décor around them. Please use the links at the top of the page to navigate to these sections, or alternatively browse below for our entire range of Custom Pool Tables. We carry all the top brands available in the market today. There is a thriving community of UK-based manufacturers which have been in the industry for years. We also sell custom pool tables from all around the world, coming from Spain, Italy and France.